We had brisk but clear night-time weather for LESC's Holiday Party, held on January 13th at the Ketch Restaurant on Platt Street in lower Manhattan. 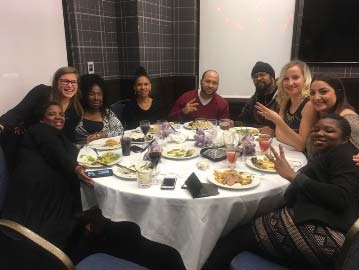 Staff enjoyed delicious hand-passed hors'doeuvres, a sit-down dinner buffet, drinks, music, and raffles! It was a well deserved, fun-filled evening to close out the holidays as well as appreciate our wonderful staff!